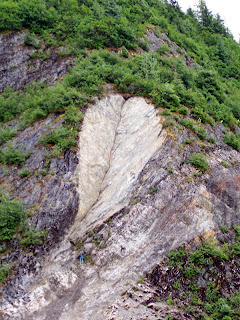 The Inside Passage: A look back. My youngest son, who is in law school, recently asked for some paperwork from his youth. I have a huge file on each kid, not too organized, which includes their artwork, academic achievements, their poetry, and for this kid . . . when he got in trouble. He didn't take the entire collection, but afraid that I'd never see the stuff again, I made copies. 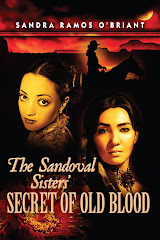 In the process I found some of my own anguished writing as the mother of a troubled teen, which started this long look back. 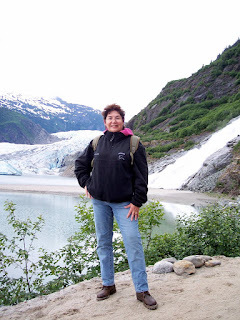 The blog that follows is from a trip to Alaska in 2007. What does that have to do with motherhood guilt? It's an example of the primary challenge of my life . . . living alone. Wait, I'm married and our college-age children were on this cruise with us. None of them joined me on my hike. Sad. I had a great time anyway. Still makes me happy to think back on what I did. The lesson for me learned from my own unhappy childhood is that you can try to influence your family, but you can't control them. Is it possible for a woman to be independent and still be nurturing? July, 2007: That's the Mendenhall Glacier to my right (your left). I'm about to hike to the falls on my left. A friendly stranger is taking this picture. My family declined to join me on this adventure. On the way to the falls, a wild bunch of senior citizens ran frantically toward me. "There's a baby bear back there," one gray-haired lady shouted breathlessly as she sped by. Even before Animal Planet I watched Disney nature features, so I knew that where there's a baby bear, there's usually a mama bear nearby. I was already braving the biohazards of cruising mall-like with my fellow Homo sapiens, mostly Midwesterner's, so an Alaskan bear on maternal overload was not to be missed. Plus, I had been feeling sorry for myself, doing this hike alone, but if my husband had been with me, he would have refused to take another step forward. That thought made me unreasonably happy. I was unfettered by spousal fears and maternal responsibilities. I could take my foolhardy leap toward certain death with Ursus Americanus. As it turned out, the bear went up a tree, and I lived to blog another day. In the picture I took, he's a frisky brown spot that only I can see toward the top of a very green tree in the middle of a forest. 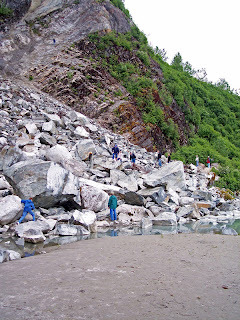 The picture of the big pile of rocks on the right is what I had to cross to get to the bottom of the falls. It wasn't easy, and several people gave up, but when I saw two grannies in loafers and knee-hi's making it across (slowly), nothing could have stopped me. 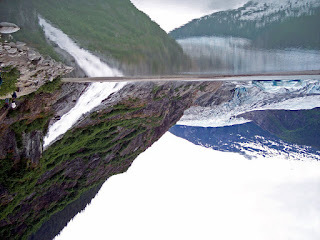 This photo is an upside-down mirror image of the waterfall, the lake and the glacier. I love the upside down clarity of this picture. A reflection on my inner reflection? I'll post some of what I wrote about his teen experience, the support I received from an online writing community (Zoetrope), and speculation as to why my son would want those notes, letters, and confessions. A creative nonfiction piece came out of the project, too. Equations in Dogtime is scheduled to be published in the Huffington Post this spring. Wow! Very cool! Love the photos. Glad you're having such an adventure. Good for you! What gorgeous country. I wouldn't be so bear-brave, but glad you didn't have to confront Mama.